I have fresh seeds of Rhopalostylis baueri 'Norfolk Is.' to give away, kindly donated by EPS member Alan Hancox. 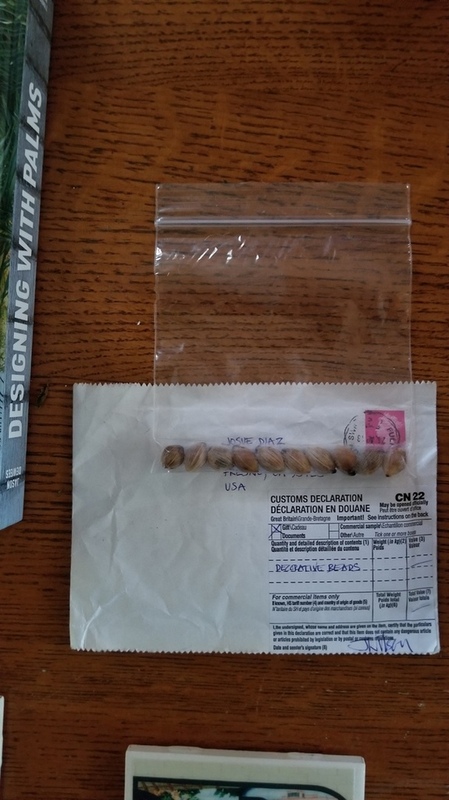 The seeds have now been cleaned and are ready to ship from the UK. Postage and packaging costs only. 10 seeds per envelope. Shipping worldwide (Non-tracked only). P&P costs to be paid in GBP via PayPal. If you have any queries or questions, please feel free to ask! Below is a photo of the mother tree taken by Alan, in his home town of Tauranga, New Zealand. I'll take a batch - thank you! Sending a PM for paypal info. Hello, I'd love to get some from you. I'll send a PM. Seeds are going out today to those who paid their postage already. Plenty more seeds available, but do remember the seeds are being sent without tracking, as it doesn't really justify triple cost for International. Time instead, to put our faith in the postal services! 5-7 working days is the estimate from the UK to Worldwide, and 3-5 days to European destinations. A generous offer, John! Payment sent. Dave, Mauricio, Christopher, Ian, Eckhard, Daniel, David, Alicia, Chris, Matthew, Francis, Ben and Danira! Thank you John. Payment sent. With Belgium - now 7 countries, and more seeds going to - Victor, Bruno, Ed and Matthew M.
Any tips for germinating this one? Anything to do different vs. more tropical/warmer climate species? I shouldn't think you'd need any more heat than you have now (58 - 75F in NW Florida?). We've just had a mini heat wave in London that saw about the same temps, and it triggered some R. sapida seeds I've had in a bag for less than 4 weeks. I definitely think the swing in temperature (day/night) was beneficial. Have u more seeds to France ? Send me pm with u paypal address for P&P please. Some of the recipients are EPS forum members, the forum of the European Palm Society. Still plenty more seeds to go around! Received the seeds. Thx John. Received the seeds. They look great. Thank you! Glad to hear they're getting through to the good ol' U.S. of A! Mine arrived today as well! Thanks! Now 9 countries - and more seeds on their way to Mark, Venkat, Matt and Derrick! Got mine in Fresno today. Thanks! From 3 random seeds (of nearly 600) received on 14th April, 2 have germinated already with temperatures in the range of 10 - 20 C / 50-70 F.
I am in. PayPal is sending you money! Got home from my latest plant buying trip and have finally gotten you paid. Thank you! My seeds arrived too . .Thank you very much . You mean you want to grow them?? The finished beads should like like this..
Good luck with the necklace! Good to hear it, Mauricio! I know you were concerned about Standard letter mail to Brasil.. This freebie offer is now closed, so congrats to everyone with seeds! The remaining seeds in a bag of soil as I don't think it does them good to 'stew' in their own moisture. 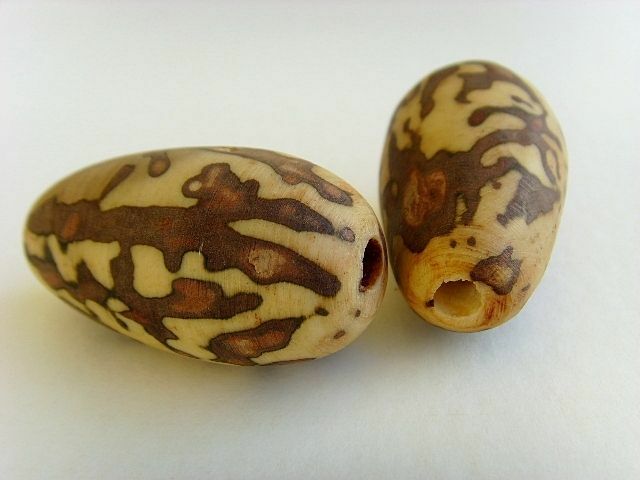 Half of the remaining seeds are blackish-looking, as they'd probably been nibbled on the ground, and having cut a few open, some of the embryos look to be turning off-white. So, it's time to get the rest sprouting to see what's left! Received my seeds in Texas today. Thanks again! Seeds arrived in Prague today, thank you! Seeds arrived in California yesterday. Thank you!! I noticed my first sprouts today!